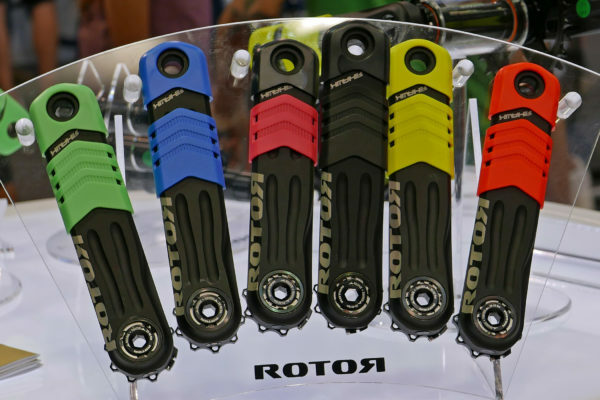 ROTOR is pleased to introduce two new cranksets to its mountain bike product offerings: both the RHawk and the RRaptor are specially designed for enduro use. The two cranksets feature extra protection to withstand abuse due to the rock strikes that are more common in enduro riding and racing. While some cranks come with molded rubber bumpers around their ends where the pedals attach, the RHawk and RRaptor also feature a large rubber bumper farther up the crankarm to protect them better against bigger rock impacts. Though both the RHawk and the RRaptor come in a standard black anodized finish with laser etched graphics, riders get to pick from seven different colors for the crankarm protectors, ranging from an understated black to bright neon yellow, orange, red, pink, blue and green. Like ROTOR’s cross-country mountain bike-oriented REX cranks, the RHawk and RRaptor are machined for maximal strength and low weight. 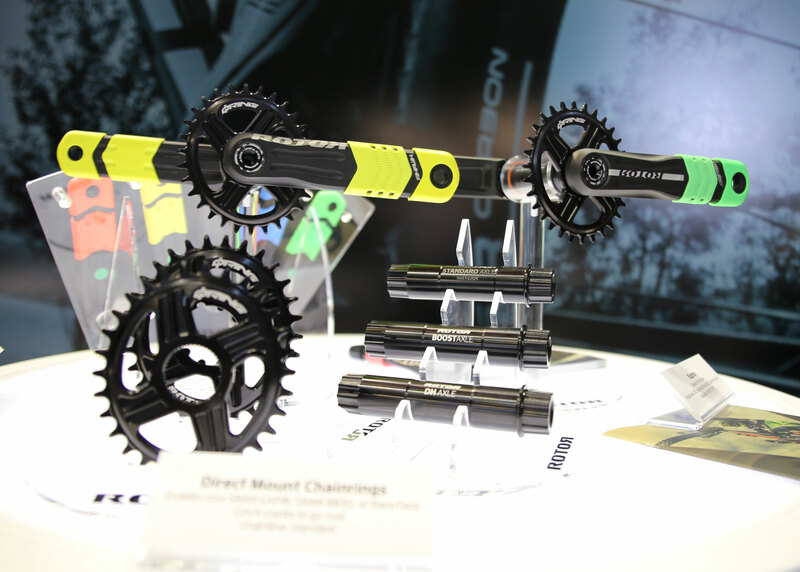 Both sets of cranks are available in 165, 170 and 175mm length options. In addition to being light and rigid, the RHawk and RRaptor cranks were designed to be modular so that they can be easily adapted to current and future spacing standards. Both have a 30mm spindle size that is compatible with a variety of bottom brackets such as BBright, BB30, PF30 and BSA, but they use a separate axle which can be swapped out to accommodate bikes used for various disciplines. Current available axle lengths include standard mountain spacing with a 164mm Q-factor and 51mm chainline; Boost spacing with a 170mm Q and 54mm chainline, or downhill spacing with a 179mm Q-factor. The modular design also extends to chainrings, which are available separately. At this time, the RHawk and RRaptor single ring-compatible spiders work with ROTOR’s new direct mount oval QX1 rings in sizes from 26T to 34T. Featuring ROTOR’s patented Optimum Chainring Position tech, the rings are easily swapped using just one tool: an 8mm allen wrench. A preload adjuster on the non-driveside crank fastens the cranks in place. ROTOR also offers direct mount rings for SRAM GXP®, BB30 and Race Face Cinch in 30T, 32T and 34T sizes – all for a standard chainline. Of the two cranksets, the 100% CNC-machined RHawk is lighter due to its material and to more CNC machining during the manufacturing process. RHawk features ROTOR’s signature Trinity Drilling System, which is a process that drills three full-depth holes along the axis of the crank. The 175mm RHawk crankset weighs 665g with a standard axle and 30T Q-Ring. The slightly heavier RRaptor does not have the longitudinal bore hole, but instead is crafted from a different aluminum alloy and has single-width, post machined recesses on the insides of each crankarm. The 175mm Raptor crankset weighs 715g with a standard axle and 30T Q-Ring.